The Shakedown Hawaii release window has been revealed. The new game from Retro City Rampage developers, Vblank Entertainment, acts as a follow-up to its 2012 indie hit. This time, however, the protagonist will not be a lowly criminal. Instead, he will be a CEO trying to take over the tropical island of Hawaii. Vblank Entertainment’s official blog has revealed the news for the Shakedown Hawaii release. The game will be launched on all announced platforms sometime in Q1 of 2019. So far it has been revealed to be coming to the PS4, PS Vita, Steam, Nintendo 3DS, and Nintendo Switch. It will be available digitally, however, there will also be a limited physical release from the developer’s online store. You can sign up to product alerts to get an email for when it becomes available. This news has also come with a new trailer for the title. 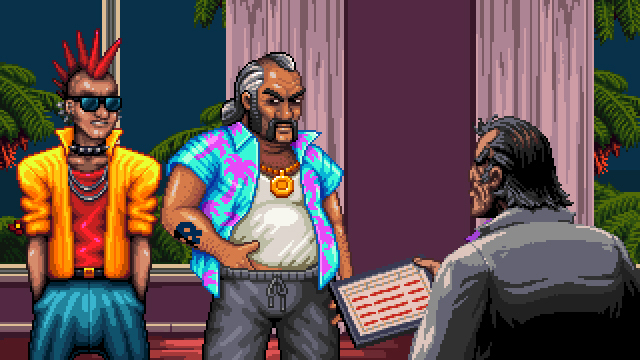 Shakedown Hawaii is a direct sequel to Retro City Rampage. Set 30 years after the events of the latter game, you take control of the same protagonist as he tries to take over Hawaii. It differs from the previous game with the introduction of a business management feature. With it, you can gain more money and control over the islands through shady business practices. The acquisitions will also offer bonuses such as getting free haircuts for taking over barbershops. That’s one way getting a trim, gratis. Some of the ways the player will expand their business will also come in the form of various minigames. It will not differ greatly from its predecessor in the large majority, however. Shakedown Hawaii will still have the Grand Theft Auto style of gameplay. You will be able to explore the whole island and wreak as much havoc as you want. Apart from the protagonist from Retro City Rampage, there will be two other playable characters. The first is the RCR protagonist’s son, who is an aspiring DJ. The second is the main character’s business partner.